This blog will describe how to enable the Smart Gateway to handle, enhance and forward incoming messages. When both taken into service, the sensor will be able to connect to the Smart Gateway via MQTT and published messages will be received but not processed in any way. The DHT22 from our sensor is capable of measuring temperature and humidity, while the ESP8266 can measure the voltage of his powersource. Each of these are published by the ESP8266 into their own topic, with the ID of the ESP8266 as part of the topic name. For later processing, this dataset itself is not enough, as applications working with this data will not know what it is, where it comes from, etc. For this reason, our Smart Gateway needs to extend this data – and while we are at it, convert it into XML. While JBoss A-MQ will be the Broker for the MQTT based communication, JBoss Fuse will be responsible for transforming the message and forwarding it. To be more specific, we will implement this task in Apache Camel, a fundamental part of JBoss Fuse. The visual representation of the implementation in Camel, called a Camel route, is very simple. Now that we did take a look at the components and logic of the “Smart” in Smart Gateway, let’s put the bits and pieces together. For the sake of simplicity, I assume that you will run all the required steps on your Raspberry Pi. This includes building the container and building the Java code. If you prefer to, e.g. build the Java code on another environment, that is fine. Please only take care, that the created deployable artifact will end up in the corresponding folder on the Raspberry Pi. maven2 is already the newest version. If you haven’t done so by following the previous blog on creating the Smart Gateway, please do build the base Docker image. pi@raspberrypi:~ $ docker build --rm -t psteiner/base . 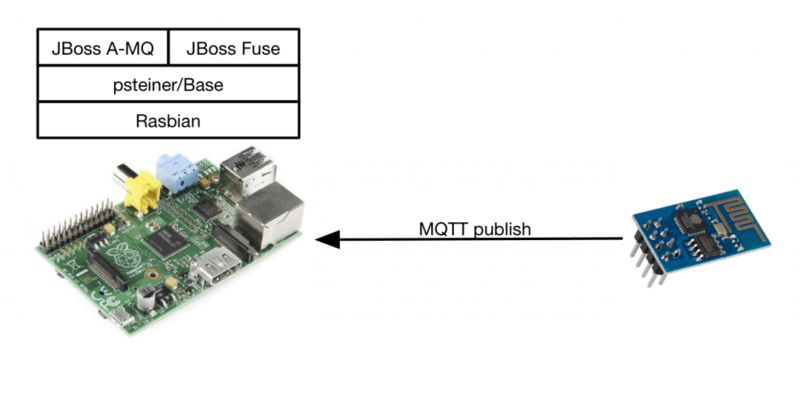 Last step is the creation of the Docker images, if you didn’t do this before, please do take a look at ‘Building a Raspberry Pi based Smart Gateway‘ for more detailed instructions. As of now, the Smart Gateway will be able to receive your messages, will enhance the data and forward it. As we have nothing to forward it to at the moment, your creativity is asked. … or stay tuned for more to come!